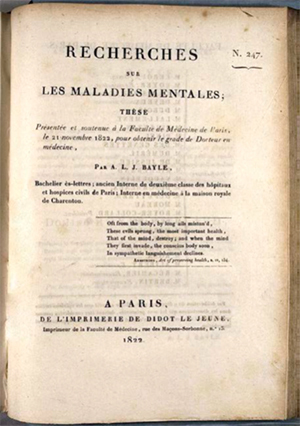 Recherches sur les maladies mentales, by Antoine Laurent Jessé Bayle (Paris, 1822). Osler Library (Paris Medical Theses Collection), Bayle. Many European and North American universities have required, at various points in their history, that medical students write a graduating thesis as part of the requisites for an MD degree. This was the case, for example, at McGill when William Osler was a medical student, and his 1872 graduating thesis, which discussed twenty autopsies and was accompanied by thirty-three gross and microscopic preparations, won a special book prize for its originality and research quality. Not all are works of genius, and some were even ghost-written by cash-strapped interns, but they all help us to understand the questions and topics of a given time, and to trace changes in the same. McGill has a collection of over thirty thousand medical theses produced by graduates of the elite Faculté de médecine de Paris between 1796 and 1920. This major collection was acquired through a 1988 purchase of approximately twenty-two thousand theses and a subsequent donation of ten thousand titles from the Canadian Institute for Scientific and Technical Information in Ottawa. This is perhaps the largest collection of Paris medical theses in North America and opens a number of avenues for scholars. Some are notable for the quality of their work and the subsequent renown of their authors, such as those by Georges Gilles de la Tourette (1857–1904), whose work in neurology includes the eponymous Tourette’s syndrome, and René-Théophile-Hyacinthe Laennec (1781–1826), inventor of the stethoscope. The collection documents numerous topics and trends in nineteenth-century medicine, such as a rise in interest in hysteria in the latter part of the century. The theses also contain biographical information about the authors, such as place of birth, providing sources for demographic research on Parisian medical students of the epoch. The thesis pictured here is by Antoine Laurent Jessé Bayle (1799–1858), who soon after his graduation became one of the founders of the French Revue médicale. His thesis represented pioneering work on general paresis, or general progressive paralysis, often now called Bayle disease. Printed by Didot le jeune, part of the multigenerational family that influenced French printing and typography throughout the eighteenth and nineteenth centuries, the title page also sports a poem by Scottish physician and poet John Armstrong (1709–1779). The Paris Medical Theses Collection is complemented by large holdings of professional French medical literature from the same period, as well as a collection of over eleven hundred theses written by students at the University of Edinburgh’s Faculty of Medicine, mostly from the period between 1790 and 1821.